Nello Tarth is a poor but happy orphan who lives with his grandfather Jehan in a little village nearby Antwerp.Nello has a talent for drawing pictures and has been fascinated by it since he saw one of Rubens(a famous artist) pictures as a little boy.Helping Jehan with the daily milk delivery to Antwerp,Nello one day discovers Patrash,a working dog who has been mistreated and abandoned by his former owner.He treats the exhausted animal and after a little while a close and dependable friendship develops. Alois Cojez,the daughter of the richest and hence most influential man in Blacken Village,is Nellos best friend.When Nello decides to become an artist he has to experience firsthand the ignorance and cruelty of the villagers.Especially Alois father thinks of him as a slacker who cannot earn his living by drawing pictures.Nontheless Nello perseveres and never gives up to achieve his dream and to win their appreciation and respect while strenuously struggling with his poverty. 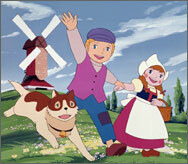 Based on the 1872 novel "A Dog of Flanders" by Marie Louisa de la Ramee.